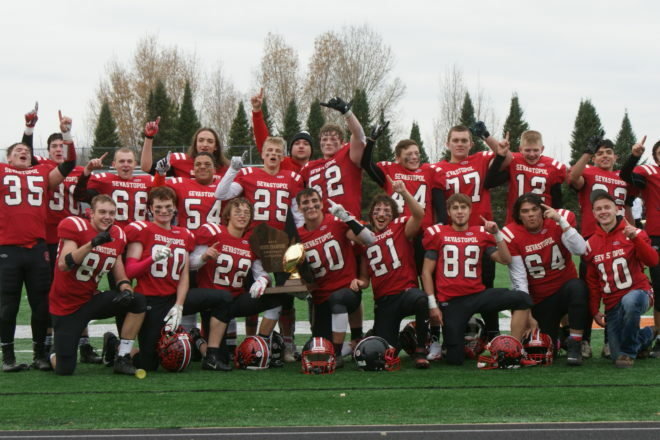 The Sevastopol Pioneers won the inaugural 8-man football state championship. Photo courtesy of Pioneer Chips, the Sevastopol student newspaper. The Sevastopol Pioneers were pioneers in more ways than one Nov. 3 at Stanley-Boyd High School, where they exercised a history of demons that goes back decades with a win sparked in part by a second-generation player. 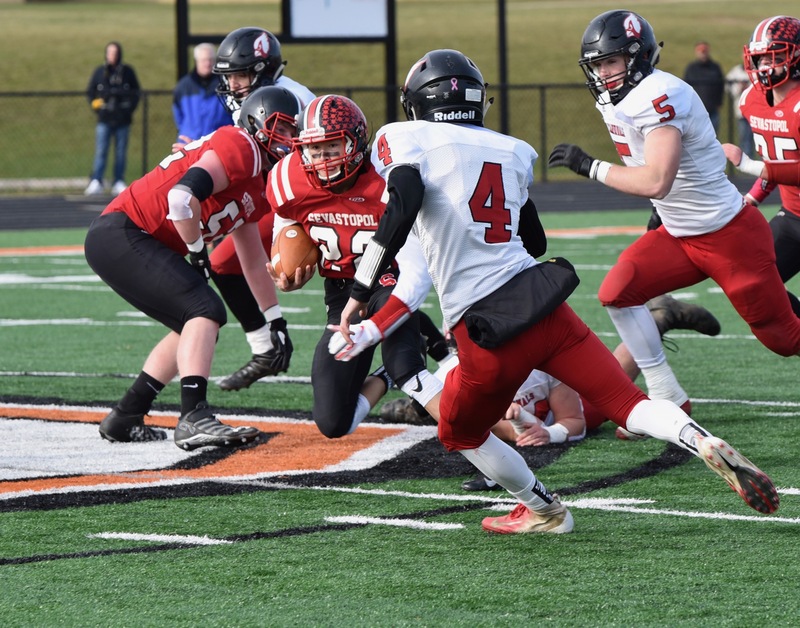 Nathan Stenzel capped off a game-winning drive with a 4-yard scoring run with 2 minutes, 8 seconds left to play to give the Pioneers a 38-30 win against Luck High School in the Wisconsin Interscholastic Athletic Association’s inaugural 8-man championship game. Stenzel also broke up a pass on fourth down that ended Luck’s last drive and capped off Sevastopol’s season at 11-1. “I was almost certain that it was going to be a pass, and when the ball was in the air all I was thinking about was knocking it down,” Stenzel said. Sevastopol’s dream finish began more like a nightmare. Dennis Brule’s 84-yard run and Hunter Sellent’s 88-yard fumble return gave the Cardinals a 16-0 lead after the first quarter. The Pioneers regrouped to tie the game at 16 on Max Krohn’s 15-yard scoring pass from Stenzel and Spencer Evenson’s 15-yard run. Luck scored again midway through the second quarter and led 24-16 at halftime. Jeremy Jorns scored on a 1-yard run to cut Luck’s lead to 24-22 early in the third quarter, but Luck responded on its next drive to pull ahead 30-22 on Bennett Jensen’s 4-yard run. The Pioneers tied the game at 30 on Stenzel’s 48-yard scoring pass to Max Krohn. Sevastopol forced Luck to punt on its next possession, setting the stage for the Pioneers’ winning drive. The win erased years of disappointment for a small school program that struggled playing much larger schools in traditional 11-man competition. The Pioneers shared a program with Gibraltar and suffered through a 10-year, 75-game Packerland Conference losing streak between 1985 and 1995, compiling an 8-90 record overall in that span. Frank entered the fray in 1991 and the Pioneers went 0-9 in each of his first four seasons. During his first of three stints coaching Sevastopol the Pioneers won just five games, and as the losses piled up the program struggled to gain even a thimbleful of respect. The streak ended mercifully in 1995 when the Pioneers defeated defending conference champion Algoma. Frank departed the program in 1998, but returned in 2005 when Sevastopol discontinued its co-op with Gibraltar. Despite leading the Pioneers to a then-school record six wins and their first playoff appearance in 2010, Frank’s record was 19-62 when he resigned in 2012 for personal reasons. Justin Skiba replaced Frank in 2013, the same year that Sevastopol transitioned to the 8-man division. The Pioneers won six games in Skiba’s first two seasons, but finished 7-3 in 2015 and earned the fourth seed in the 8-man state jamboree. 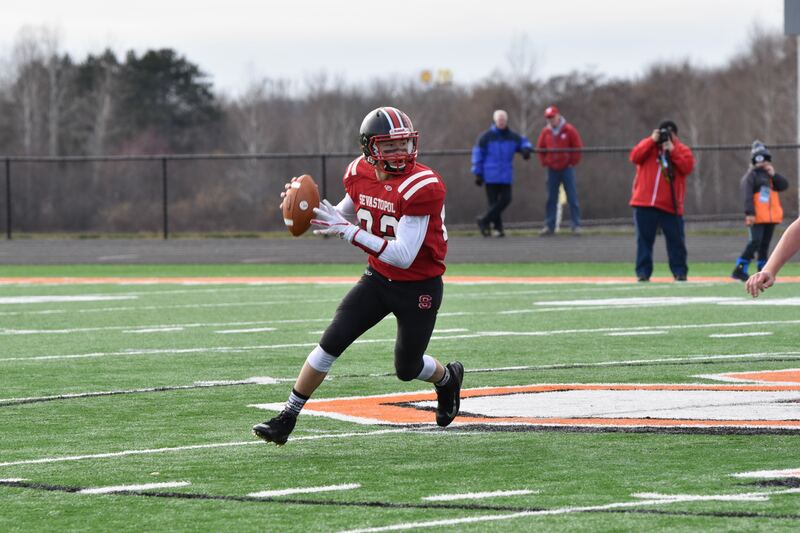 Frank returned for his third stint in 2016, and after posting 16 wins in his two seasons back, the Pioneers claimed the state’s first 8-man title – and a bit of redemption for years of struggle.